A few months ago I was talking with a retired lawyer with a mass tort claim that fit squarely within our firm’s criteria. Given the details he provided, there really wasn’t a lot to do pre-suit, my next steps would be to get the medical records to confirm what happened, file the complaint, and then get to work. Being a lawyer, he unsurprisingly wanted to know the whole process “from start to finish,” so we spent a while on the phone talking about short form complaints, plaintiff’s fact sheets, the plaintiff’s steering committee, the bellwether trials, and so on. The machinery of mass torts litigation isn’t an easy thing to explain; everybody knows (or thinks they know) what a class action is, but there aren’t actually any “class actions” for drug injuries, there’s just federal multidistrict litigation (MDL) and state consolidated litigation, both of which are strange hybrids between class actions and individual suits. When we finished up and I told him that we would get to work on his case, he said “and I’ll do my part by re-reading John Grisham’s The Litigators,” and we shared a laugh. It seems like most of the lawyers I know disdain Grisham’s novels the same way doctors disdain ER and Grey’s Anatomy, and, quite frankly I had never read one nor had an interest in reading one. Like many lawyers, I find legal fiction — whether a novel, a TV show, or movie — painful. It’s either banal or unbelievable, and even the slightest misstep in the details ruins the suspension of disbelief. Most of it looks like this to me. [A] huge plaintiffs’ firm in Florida is putting together a class action suit against [Krayoxx, a cholesterol drug potentially linked to heart attacks]. All Finley & Figg has to do is find a handful of people who have had heart attacks while taking Krayoxx, convince them to become clients, join the class action, and ride along to fame and fortune. With any luck, they won’t even have to enter a courtroom! It almost seems too good to be true. And it is. I’ve written before about ambulance chasing lawyers, and how mass torts cases aren’t as easy as some lawyers claim, so onto the Kindle The Litigators went. I prepared myself for the worst, not least because of the blurb’s erroneous reference to “class actions” instead of “multidistrict” or “consolidated” litigation. Surprisingly, I liked it, for the same reason I thought Boston Legal was the best of the TV lawyer dramas: Grisham doesn’t try for pure realism and fail, instead he satirizes mass torts (and injury litigation as a whole) by taking real themes and then exaggerating them. There are various inaccuracies and far-fetched plot devices, but they can be forgiven because the book rings true as it lampoons the field. In portraying Finley & Figg, the book touches upon the real themes of practice outside of the big firms, like the strange mixture of constant boredom and stress that permeates a “general practitioner” who dabbles in several fields but masters none, and the toll that takes on the lawyers and their families. While lawyers considering solo and small practice often think they can build an enjoyable practice filled with fascinating work that balances lucrative contingent fee work with steady billable work, such an idea is usually a terrible business model, and the typical small law practice is characterized by monotony, modest income, and a perpetual hustle for business just to keep it afloat. When it comes to a small law firm, if you weren’t born with the entrepreneurial spirit, then you’re just going to have to force it. The life of the two-bit lawyer is then contrasted with the apparent prestige of big firm work, often just a façade for soul-sucking hours and work that is ethically permissible under the standards of the profession but largely immoral under the standards of basic human decency. When one character’s spouse questions the ambulance chasing ethics at Finley & Figg, he reminds her of one of his big corporate firm’s most prominent cases: the firm fought for years — successfully — to preserve a polluter’s “right” to dump toxic chemicals in a river. That ends the argument. The real-life themes of mass torts are accurate, as well. Grisham shows, for example, the ruthlessness of the pharmaceutical companies and the wars of attrition and delay they launch with essentially unlimited resources, and the uneasy relationship between the individual attorneys that get the clients and the specialized mass torts bar that litigates the cases (as Mark Lanier calls this divide in the asbestos context, “chicken catchers and chicken pluckers”). Then there’s the ultimate reality that, for all the huffing and puffing of lawyers for both sides, once the pre-trial issues are resolved, the trials themselves are typically decided based on the science. 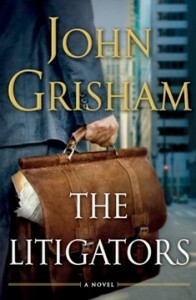 Points of the book had me genuinely laughing out loud, and other reviewers have noted that The Litigators is perhaps Grisham’s funniest book. I thus recommend the book for lawyers looking for something light and funny. I am a bit concerned that non-lawyers may be learning about the law through the book, not recognizing it is a satirical version of mass torts, not a documentary.